Authorities searched on Monday for more than 200 people unaccounted for in one of the wildfires rampaging through parts of California, voicing concern about a possible rising death toll, as gusty, dry winds spurred the flames. The so-called Camp Fire, California's most destructive on record, had left at least 228 people missing as of early Monday, according to Kory Honea, sheriff of northern California's Butte County, site of the fire. That fire and one in southern California have killed at least 31 people. Both fires have been whipped up by hot dry winds expected to continue through Tuesday evening, according to officials. The winds were expected to heighten the risk of fresh blazes ignited by scattered embers. More than 224,000 people have been displaced by the fires, officials said. The Camp Fire, 40 miles (60 km) north of Sacramento, burned down more than 6,700 homes and businesses in the town of Paradise, more structures than any other wildfire recorded in California. The blazes left behind scenes of utter ruin, with homes and businesses reduced to charred wreckage. The fire had scorched more than 113,000 acres and was 25 percent contained, officials said on Monday. Its death toll of 29 equals that of the Griffith Park Fire in 1933, the deadliest wildfire on record in California. The blaze has probably caused between $2 billion and $4 billion in insured property damage, Morgan Stanley estimated in a report on Monday. Speaking on CNN, Honea said while he holds out hope that many people listed as missing will turn up safe, "given what we've dealt with so far with casualties as a result of this fire, I have concerns that it (the death toll) will rise." In southern California, the Woolsey Fire had burned more than 91,000 acres and was 20 percent contained, officials said. 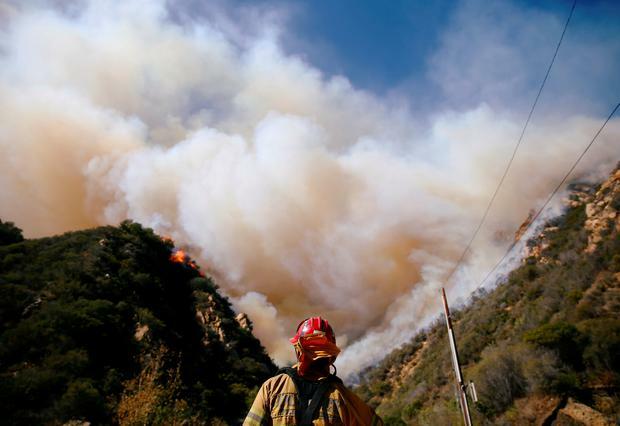 The fire had forced authorities to issue evacuation orders for a quarter million people in Ventura and Los Angeles counties and beachside communities including the Malibu beach colony. By Sunday night parts of the two counties were reopened. At least two people have died in the Woolsey Fire, according to officials from the statewide agency Cal Fire, which has more than 3,200 personnel fighting the blaze. Malibu resident Tony Haynes described how strong winds brought the fire through his neighborhood during the weekend, with the sky growing dark, saying there was so much smoke he put on his scuba-diving tank to breathe. Haynes said his home survived. "It all came down to luck and a whole lot of buckets of water," he told KTLA 5. A smaller blaze in Southern California, the Hill Fire, was 75 percent contained and had burned 4,531 acres, officials said. Local residents were despondent over the fire damage. "It's not the house, because you can rebuild. But it's what is inside the house. 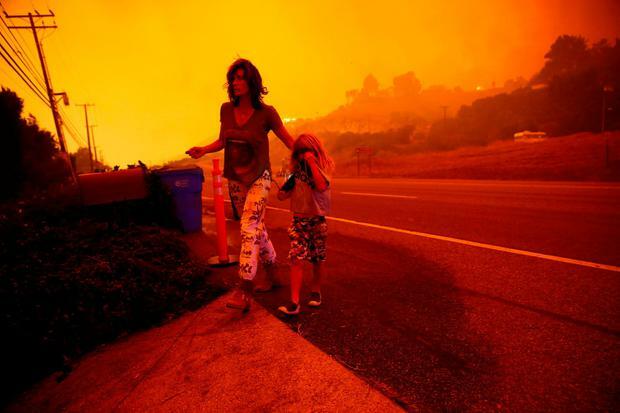 It's all gone," Malibu resident Marcella Shirk, 82, told KABC-TV. "And that's what hurts, those kinds of things hurt, because you can't replace that." She and her husband lost their house of 41 years and its possessions. The house burned on his 92nd birthday. California utility stocks plummeted for a second trading day on Monday. Shares of PG&E Corp, which operates in northern California, dropped 16 percent, bringing its decline over two sessions to 29 percent, equivalent to $8 billion. Edison International, owner of Southern California Edison Company, slumped 11 percent, leaving its stock market value $5 billion lower since Thursday, when the fires broke out. Governor Jerry Brown, a Democrat, has asked U.S. President Donald Trump to declare a major disaster to bolster the emergency response and help residents recover. Trump, a Republican who has often criticized Democrat-led California on a variety of issues including immigration enforcement, faulted the state government in Twitter comments during the weekend, blaming poor forest management by the state for the infernos. Brian Rice, president of the California Professional Firefighters, called Trump's statement "ill-timed" given the loss of life and ongoing search for missing people. "You can't just make a blanket statement," Rice told MSNBC on Monday, adding that fires and forest management were complicated and that weather also was a major factor. "Right now, what is needed is, really, support," Rice said.